The newly-built Mercure Bali Nusa Dua opened on 23 September 2012, just a stone's throw from the prominent Bali Tourism Development (BTDC) complex, and the hotel is ideally located for access to the Bali International Convention Centre and the many shopping, dining and entertainment options of the Bali Collection Shopping Mall. Located a mere 14 kilometers from Bali's International Ngurah Rai Airport and 25 minutes from the chic and lively areas of Seminyak and Kuta and Legian, the hotel is ideal for business and leisure travellers alike. The hotel features 201 comfortable, contemporary rooms including 150 Superior rooms, 43 Deluxe rooms and 8 Junior Suites. Guests can indulge at the restaurant which serves local and international dishes for breakfast, lunch and dinner, sit down for a drink in the lobby or relax at the pool bar, work out in the fully-equipped fitness centre, or enjoy the hotel's unique swimming pool, divided over two levels and connected by a waterfall. Three meeting rooms with a capacity of up to 200 people can accommodate conferences, weddings and other events, while the business centre services and lobby internet corner round out the hotel's business facilities. All rooms are designed to reflect the identity and heritage of Bali, while embracing the contemporary style of Mercure. Each room is equipped with premium in-room amenities including international cable television channels and free WiFi Internet access. "We are very excited to join the network of Mercure hotels in Bali," commented Peter Stolk, General Manager of Mercure Bali Nusa Dua. "The right location and contemporary design make this hotel an attractive destination for both business and leisure travelers looking for slice of paradise on Bali." 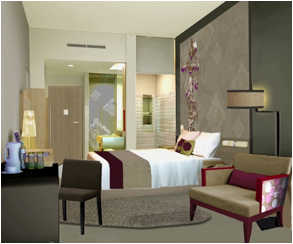 To celebrate its opening, Mercure Bali Nusa Dua is offering a special launch promotion with room rates starting from IDR 690,000++ per room per night (approximately $85AU including taxes) valid for booking and travel up until 20 December 2012.